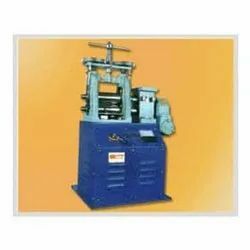 Prominent & Leading Manufacturer from Ahmedabad, we offer 5 x 2.5 inch gold smith single head sheet rolling machine. We offer 5 x 2.5 inch Gold Smith Single Head Sheet Rolling Machine. The offered machinery is precisely engineered using high-grade materials and delivers optimal performance. It's direct wheel and gear system makes it highly efficient and easy to operate. These machines are competitively priced.